The hills around Lake Geneva will come alive this week as two of Switzerland’s most historic and prestigious international sporting events have cause for milestone celebrations. A rejuvenated Omega European Masters golf competition, played on the Seve Ballesteros course at Crans-sur-Sierre from July 20-26, welcomes back some of the world’s top players following a comprehensive overhaul of its venerable fairways, while the Swiss Open tennis tournament, held at the Roy Emerson Arena in Gstaad, marks its 100th anniversary from July 26-August 2. 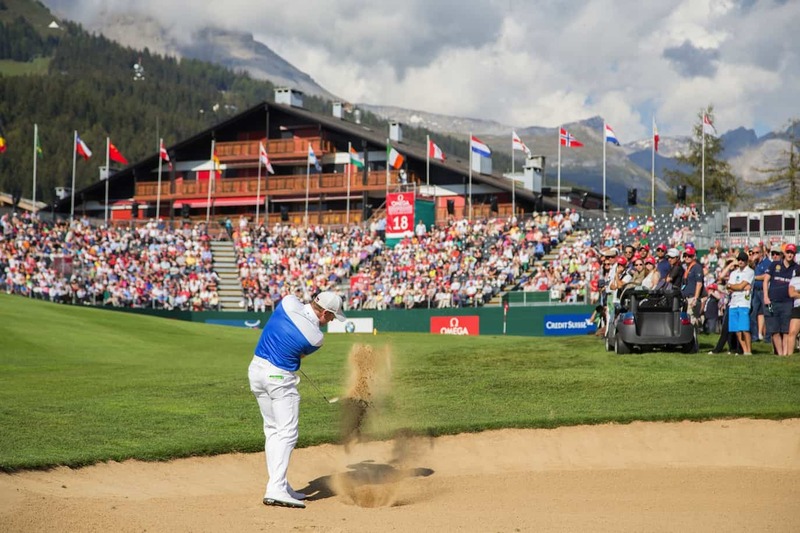 The scheduling of the two events on consecutive weeks is a new phenomenon – the result of a longstanding campaign by the Crans organising committee to find a calendar slot more conducive to attracting the golfing elite. With the event held in September, most star players have in recent years been drawn away by the sunshine and megabucks on offer across the Atlantic at the US PGA Tour’s end-of-season FedEx Cup playoffs. Though it’s still early days, the switch to July appears to be paying off. 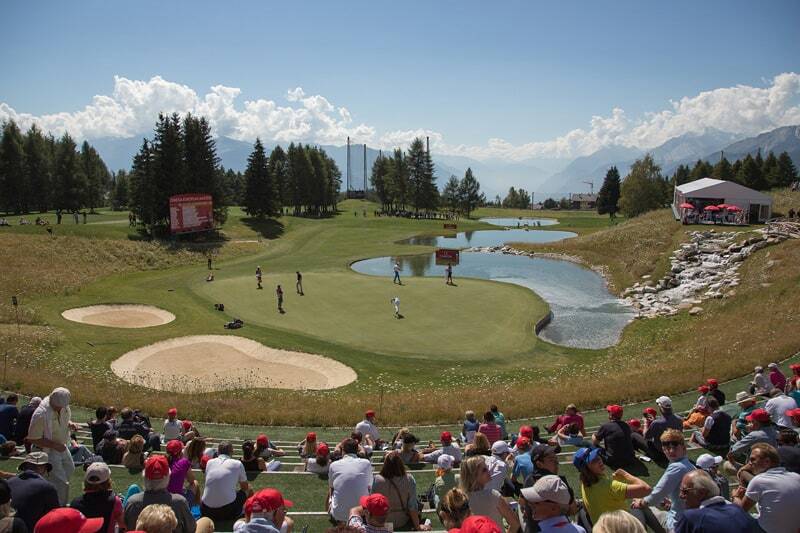 It has long been a source of frustration for Yves Mittaz, the tournament director, that regular world top-ten players Sergio García and Adam Scott, both residing members of the Crans-sur-Sierre club, do not play in their home event. But García, who won the tournament back in 2005, confirmed in January that he would spearhead the recruitment drive and return for the first time in nine years. Fellow European Ryder Cup star Lee Westwood, another normally found plying his trade on American soil, has since followed suit and confirmed his participation in Crans, while Texan rising star Patrick Reed – a gifted but controversial figure with a penchant for winding up European crowds – has recently become an additional feather in the organisers’ cap, announcing his debut appearance in the Swiss event. 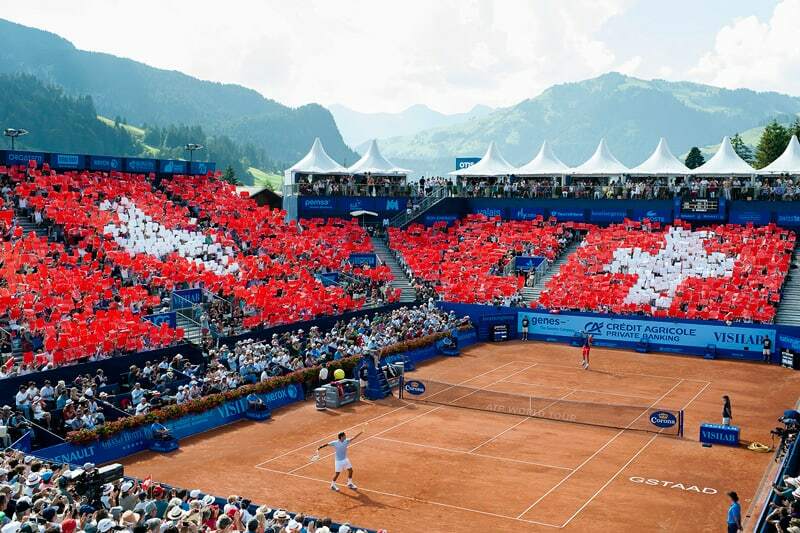 Across the glaciers in Gstaad, meanwhile, final preparations are underway for the centenary of the remarkable Swiss Open tennis, which has in recent years welcomed home-country aces Roger Federer and Stan Wawrinka to its intimate clay courts. The recently crowned French Open champion Wawrinka is once more set to be the star attraction in 2015 – accompanied, quite possibly, by the famous red patterned shorts that earned a devoted following in Paris – while a programme of festivities and special guests is lined up to mark the anniversary. The two historic events have plenty in common – not least a star-studded list of former champions. Past winners in Gstaad range from modern era greats like Federer and Stefan Edberg back to doyens of tennis history such as Emerson – a five-time champion on the court that now bears his name – Ken Rosewall, Guillermo Vilas and Ilie Nastase. The Romanian Nastase, a world number one back in the 1970s and renowned as one of the sport’s great entertainers, is among the participants in a celebratory doubles match in Gstaad on Sunday July 26. Others set to take part in the one-off exhibition include Spaniard Alex Corretja, one of the best clay-court players of the 1990s and three times a champion in the Bernese Oberland. The roll of honour in Crans, meanwhile, includes famous golfing names like Ballesteros (a three-time victor), Ernie Els, Jose Maria Olazábal, Colin Montgomerie and Sir Nick Faldo, while current world number one Rory McIlroy has also starred in the event, being narrowly beaten to the title in a playoff back in 2008 when he was just 19 years old. The Northern Irishman’s average score around the Seve course of 67.7 remains the second-best on record, behind only Englishman Luke Donald, another former winner in the Valais. Like many of the traditional Alpine winter sports, both events also have strong historical links to Britain. Ski industry pioneer Sir Arnold Lunn first brought golf to Crans back in 1906, as he sought to develop a year-round tourism offering for his wealthy clients. Tennis in Gstaad, meanwhile, has long been played under the affectionate moniker ‘Wimbledon of the Alps’, ever since the days when the tournament was held the week after London’s famous grass-court contest and Emerson and the gang would pitch up in the Saanenland for an extended celebration. With some irony, the European Masters now finds itself scheduled the week after the showpiece British Open golf championship – perhaps a mixed blessing in the publicity stakes. But any ‘St Andrews of the Alps’ label would probably do this stunning Swiss course a disservice; pretty though its royal and ancient cousin certainly is, you can’t see many pristine fir trees, glacial valleys or snow-capped 4,000m peaks from those windswept Scottish fairways. But in an age where muscled players thwack the ball 350 yards off the tee and developing nations from Turkey to China fight to host lucrative new events, scenery alone is no longer enough for Crans to compete. Major investment has been made in a five-year modernisation of the course, with improvements to both its design and infrastructure yielding a championship venue now truly fit for the modern era. There are plenty of mountains, too, on show at the Roy Emerson Arena, perhaps the most charming and unlikely venue to witness ATP-sanctioned tennis all season long. It can be hard, certainly, to keep your eye on the groundstrokes and volleys with a backdrop of rustic chalets and rolling green hills to avert the gaze. Emerson himself had the same problem: now 78, the twelve-time major champion continues to return annually, running tennis camps from the luxury of the Palace hotel. Though recently hailed as “one of the best-run tournaments on the Tour” by ATP President Chris Kermode, the Gstaad event, like its golfing counterpart, has faced its share of peril down the years. Financial woes threatened its very existence just a decade ago, and it was not until the arrival of current Morges-based organisers Grand Chelem Group that stability was achieved and the fragile confidence of the local community restored in its long-cherished event. It should probably come as no surprise that the Grand Chelem team, led by Jeff Collet and Julien Finkbeiner, proved able to fashion a calm path through stormy waters: they previously did the marketing for Swiss sailing superteam Alinghi, winners of the prestigious America’s Cup back in 2003 and 2007 as they became one of the iconic global sports brands of the early 21st-century. Modern tennis legend Roger Federer’s return in 2013 to the tournament that gave him his first ATP wildcard appearance back in 1998 was symbolic: not only in reinforcing the link between Wimbledon and Gstaad – Federer having requested a last-minute entry following a shock early exit in London – but in showing that this historic event deep in the hills is still able to make headlines in an ever more crowded global marketplace for sporting events. From Emerson to Ballesteros and Federer to McIlroy, the two Swiss events have between them welcomed some of the greatest summer sporting champions the world has known. As they look to the future with renewed optimism, the next chapter in their long histories is just waiting to be written. Tickets for both events are still available (pay on the gate in Crans; check availability before travelling to Gstaad). A fascinating magazine on the history of Gstaad’s international tennis tournament (‘Great Tennis in a Small Mountain Village: 100 Years of Tennis in Gstaad’) is available in hard-copy format from the local tourist office. Update: Wawrinka has said he will not play at Gstaad this year according to an article in the newspaper Le Matin.